Most adult ballet beginners are exactly that: professional adults—lawyers, doctors, teachers, bankers—who live extremely busy lives and do not have the time to take regular ballet class. In fact, many of them either took ballet “lessons” when they were young children or are starting from scratch as adults. What they lack in aptitude and suitability is more than compensated for by their open minds and willingness to try their best. Even so, they sometimes feel discouraged (or lost) in the most basic Absolute Beginner class. Initially, I thought the solution was to offer monthly intensives, but that did not seem like enough. Starting this fall, adult beginners can improve their ballet technique in a new series called FINIS FRIDAYS: three different 2-hour classes to be held at the Pearl Studios in Midtown Manhattan. The first class is titled LET’S DANCE! and will be exactly that. It begins with a short barre followed by exercises in center floor which teach correct body and arm positions; connecting footwork that travels in different directions; the waltz and balancé, and choreographed dances. If time permits, basic jumps will be included. The second class is titled TURNOUT, EXTENSION, and begins with a warm-up jog, followed by seated and reclined stretches taken from my video Stretch, Turnout & Extension. After this, the students will come to the barre and work on selected barre exercises which will help stabilize turnout and extension. This class will end with relaxing floor stretches. The third class is PIROUETTES, TURNS. After a short barre, students will practice preparing for and executing pirouettes en dehors and en dedans, châinés, and piqué turns. As always, the emphasis will be on teaching students the “untaught” preparations all good dancers use onstage, but which go unseen by the uneducated eye. We are going to enjoy unraveling the mysteries of turns! These slowly paced, extremely detailed, step-by-step classes have proven to be remarkably effective. Not only do the students learn the material needed, they also develop self-esteem as they discover that they are capable of doing more challenging ballet work. Some of the more avid students further their knowledge by studying my instructional videos at home, and that too has proven effective. Now, these “Adult Babies” are ready to move confidently with the rest of the class! Ultimately, it’s the classroom experience where we are all together that makes the biggest difference in helping my “ballet babies” advance. It requires extreme patience and constant instruction on my part, and devoted concentration and muscular involvement on theirs. But time has proven that this is the best way to teach adult beginner ballet students what they need to know. FINIS FRIDAYS will help ballet newcomers learn how to move with graceful dignity and strength, both in the studio, and in the world. Posted in Adult Ballet Students, Ballet, Ballet for Beginners, Ballet Teacher, Ballet Technique, Dance Technique, FINIS FRIDAYSTagged arabesque, balance, ballet, ballet positions, ballet technique, beauty, control, finisjhung, improve your dancing, infinite possibilities, life is a journey, pirouette, standing leg, strengthLeave a Comment on Why FINIS FRIDAYS? Pictured above: Russell with two lovely partners, Claire and Christina. I call my adult students my “ballet babies” because, like young children, they are so eager to learn, are “pure” in that they have no pre-conceived notions, and dance as if there is no tomorrow. Some of my babies are teachers and students who live in Australia. Some have attended my workshops; all use my videos and music; and most have my memoir Ballet for Life. Russell Merriman lives in Bicton, Western Australia, and began studying with my streaming videos this year. Streaming from Perth We stern Australia is phenomenal. It is simple to log on and there are no delays in finding my videos. I am a ‘mature’ student. I turn 75 years of age on July 19. My ballet has improved dramatically since I started using your streaming videos. I have started pas de deux and my partner who was a professional ballet dancer thinks that I am a ‘natural.’ I purchased your Partnering Techniques DVD. My first dance technique was contemporary dance. While a student at Flinders University of South Australia I attended a week-long workshop at Australian Dance Theatre in Adelaide. I was aged 30 years and very stiff and inflexible. I was excited when, at the end, we performed a dance to the song of Buffy Sainte-Marie: God is alive, Magic is afoot. How prescient for my life! 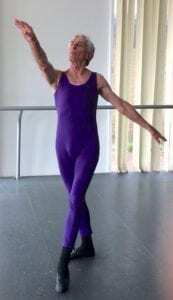 I then joined a small group of dancers at Flinders University and after we performed, I was ‘hooked.’ I moved to Perth in 1974 and commenced contemporary dance classes with Ruth Osborne, wo taught the Graham Technique. After I turned 40, I found an introduction to ballet of eight free classes. After discovering pirouettes I never stopped. Around the same time, I joined the Keszkeno Hungarian Dance group. I was mesmerized by the athleticism of the male dancers and remained with the group until 2016. We performed at concerts in Sydney, Melbourne, Brisbane, and Hungary. I had to stop Hungarian dance as an old ankle injury couldn’t cope with the stamping. I continued ballet classes, and my first brief ballet performance in October 2017 included a ‘mini’ pas de deux which introduced me to the delights of partnering. I have found that the secret of ballet is that it is anti-gravity as the movement is all UP. This lengthens the spine and frees up space in the joints. Obviously this counteracts the normal effect of aging where people ‘shrink’ and their body contracts. The change in one’s posture from ballet can be dramatic (mine has) and it results in new breathing patterns. So, like Finis, I will never give up. PS: My favorite video right now is The Art of Teaching Jumps. I’ve had double hip-surgery, but will persist with patience and determination for my share of air-time. NOTE FROM FINIS JHUNG: And I just recommended Ballet Barre Foot Strength Exercises to help Russell strengthen his feet and ankles so he can jump higher. The demi-plié is almost isometric. In both the downward and upward movements, the feet—rather than the knees—should initiate the movements. The feet grip the floor and pull the legs into the plié and then relax and push down to return the legs to the standing position. This also applies to pliés on one foot. Most dance movements are on one leg. 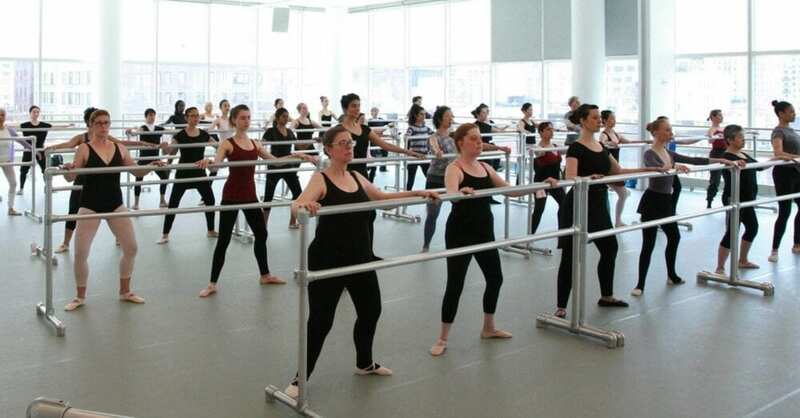 What must be developed at the barre is the ability to balance on and move from one foot. Try to work at portable barre placed parallel to the mirror. Stand behind the barre, on the diagonal. This will allow you to keep an eye on your supporting side and encourage you to work correctly. Test your balance by frequently taking your hand off the barre during exercises. In addition, check your readiness to move. You should always be able to rise off your heel whenever you press down on the floor. The supporting leg controls the free leg, and initiates each movement. The timing of every movement is made by the supporting leg. The free leg (the foot that brushes or slides) never pulls or moves the body. Only the supporting foot that pushes the floor should move the body. In the center floor, every step you take must be balanced by an arm, or both arms, reaching in the opposite direction. At the barre, develop this sense of the “back arm” by reaching for the barre and pressing down it. Never pull on the barre. A jump is a relevé in the air. Push the floor, stand in the air. Overcross the glissade précipitée, which leads into battement fondu developpé relevé, and jumping steps where the free leg is brushed into the air. People have been asking me to write my biography for years. But, I don’t like looking backward – I’m always trying to think of new ways to teach ballet, so my mind is always focused on the present and future moments. 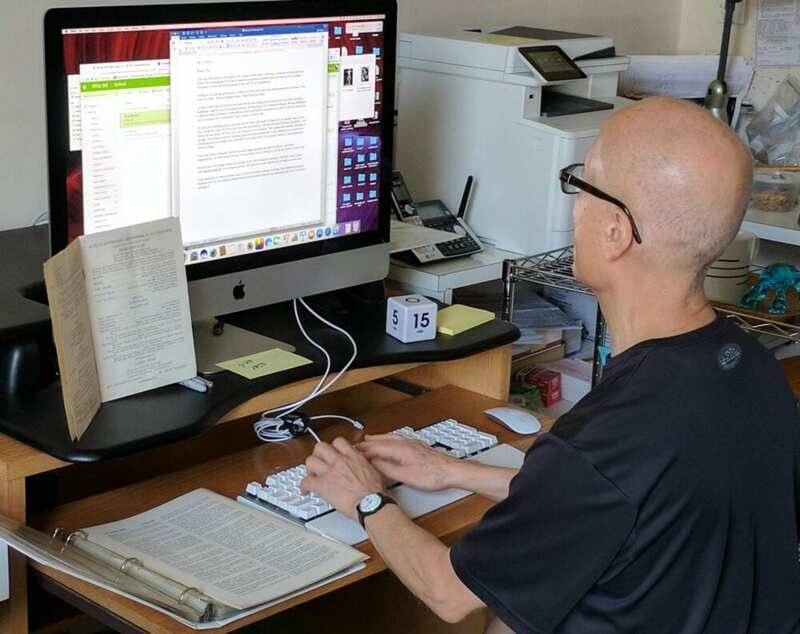 This past winter, my son Jason started producing my new FJ Single Streaming Exercise videos and he sat me down for an interview for what was supposed to be a short video for the About section on my website. He asked me a question about when I first found my love for ballet, and I ended up talking for 40 minutes and more or less told the story of my life since I first began dancing at age 9 in WWII Honolulu. 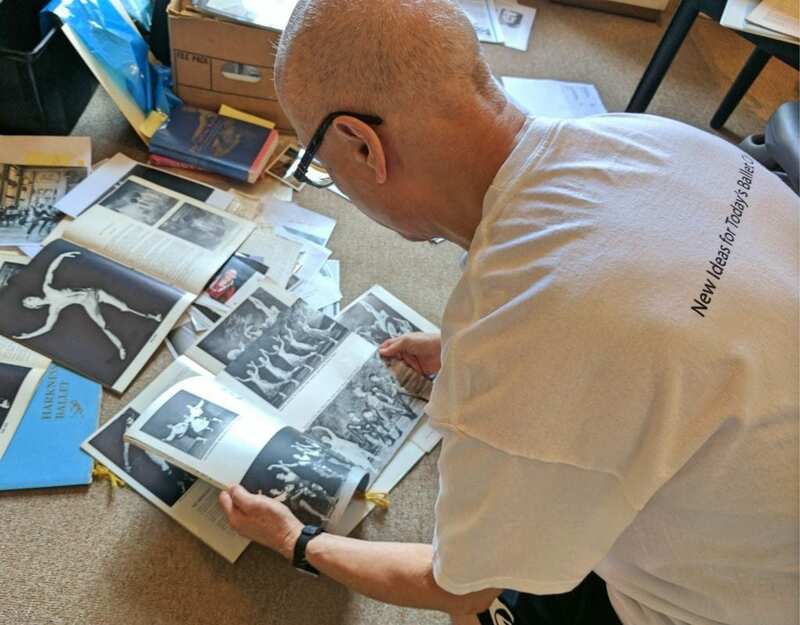 After finally watching the whole interview, I began looking through my photo collection, and realized I have a lot of very interesting pictures from my past 71 years of loving ballet. So, I thought, why not a pictorial memoir? Not a biography with zillions of words, but more like a scrapbook of interesting photos and little stories about them. I spent most of January and February collecting all the photos I could find: from growing up in Honolulu, studying with “Mr. C” (William F. Christensen) at the U. of U., dancing on broadway in Flower Drum Song, joining the San Francisco Ballet, going to Hollywood to dance in the film version of Flower Drum, joining the Joffrey Ballet, the Harkness Ballet, leaving the ballet world for 3 years to devote myself to world peace through Buddhism, opening the Finis Jhung Ballet Studio, getting married, losing our first child to meningitis, but then having another son, Jason, who is today my office manager and emerging video producer, founding and directing my own Chamber Ballet USA, going through a divorce and single-parenting Jason, teaching in all the major studios in NY, and at workshops in the USA and Europe, and producing more than 50 instructional ballet videos and 18 music CDs for the ballet class, and today teaching my adult babies at The Ailey Extension. What has been extremely time-consuming, frustrating and rewarding was locating the photographers who took the photos so that I could have their permission to publish. Michael Avedon photographed the Harkness Ballet, and after weeks of searching I was told that, sadly, he had passed away. I was greatly saddened to learn this as we had been good friends. And even more saddened to know that I would not be able to use his photos. 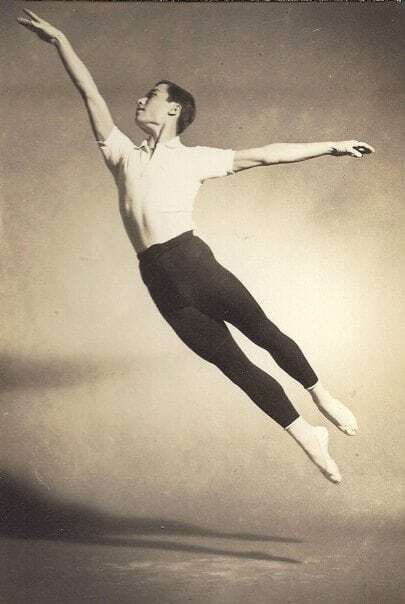 And then, through Christine Redpath, I was referred to Mimi Paul (yes, that gorgeous NYCB ballerina of the 60’s) who told me Michael is very much alive! And now I have secured his permission, and you will be able to enjoy his photographic artistry. I did not keep diaries, and, in fact, I threw out some incredible media when I left the ballet world, so it is challenging to try to remember specific events. But at the same time, I am being energized as I realize through the photos all the wonderful events that have happened so far have fulfilled all my childhood dreams I had growing up in a poor family in Honolulu. I am blessed, and hope to share that with you in BALLET FOR LIFE: A Pictorial Memoir by Finis Jhung. Finally, do any of you have a favorite memoir? If so, what do you love about it? To Dance is to Live! Ballet is about balance. Every movement in dance – from the simplest motion to the most complicated center floor combination – requires a solid foundation and concentrated energy. Achieving this centeredness can bring about greater discipline and understanding in all aspects of life. During my career as a professional dancer, I was proud to be a part of talented companies that could make the grace and beauty of ballet seem effortless. As an instructor, I often tell my adult beginners that even these masterful and soaring performances started from the ground up – with a focus on footwork. When working with my students, one of my biggest on-going challenges is finding better ways to teach these students how to demi-plié and relevé so that they will balance, turn, and jump with strength and control. Students should work with the understanding that almost every movement we make in ballet consists of a plié and a relevé – a rising to a balance on the half-toe. Simply put, we go down to go up. Therefore, learning to plié-relevé correctly is of the utmost importance. Even students with previous training make the same mistake as absolute beginners in that they think “pose” instead of “action.” They begin by bending the knees and then sink down into a PASSIVE pose with legs and feet relaxed. This does not strengthen the feet or legs, nor does it prepare them to spring up quickly into a balance, turn, or jump. That is precisely why I teach the ACTIVE almost-isometric demi-plié – initiated by the toes gripping the floor and pulling the legs into a minimal plié. The muscles of the foot and ankle are actively engaged, which prepares the foot to spring up on the half-toe. Coming out of the preparatory plié is achieved by reversing the action: the foot is relaxed, the toes are spread, and you push down until you rise on half-toe with legs straight and the weight of your body reaching the tips of the toes. Learning to think with your feet and have your feet activate your legs is not taught in the traditional ballet class. Once students have tried making the demi-plié from their toes to their toes, they say they can feel the difference and find they have much better balance and control. The benefits of doing supplementary exercises outside the ballet class that will strengthen your foot and ankle goes cannot be underestimated. A little practice each day at home will strengthen your feet and ankles, improve your balance, and lessen the chances of falling and twisting or spraining your ankle or knee. For this reason, I am introducing new “single-exercise” streaming videos that can be viewed anywhere, anytime, provided there is internet and a viewing device. These relatively short single-subject videos have three sections: first I show and describe the exercise; next, with the demonstrator, I break down the exercise to its essentials, especially detailing the muscular control and sequence of movement through the body parts; and then it is demonstrated to music by the dancer with me standing by coaching. The first series of three videos is titled FOOT STRENGTH and is demonstrated by Vernard Gilmore of The Alvin Ailey American Dance Theater. I am so happy that Vernard was available to do this video. It was such a wonderful experience to come full circle with a former student who is today a greatly admired artist and human being. It’s that time of the year again – out with the old, in with the new. Now, I’m not suggesting everyone will want to do what I did, when I discovered that burning your bridges to the past can open doors you never knew existed. In 1968, I was a principal dancer with The Harkness Ballet in Monte Carlo. My childhood dreams had been fulfilled—I only wore white tights and danced classical roles. I was also I a devout Buddhist (having converted 20 Company members), and, one day, had a realization: “I can’t be lying here at the swimming pool in Monte Carlo doing nothing”—while the world is in tumult following the assassinations of JFK, Martin Luther King and Robert Kennedy; Vietnam; hippies; LSD; women’s lib; racism; and college protests. In January 1969, The Harkness Ballet performed in New York. Shortly after the season, I told Larry Rhodes, who was the director, that I had decided to stop dancing so that I could devote my life to achieving world peace through Buddhism. I had no idea what I was going to do for a living. After sitting in a hot tub and crying my heart out over what I then thought was the greatest mistake I had ever made, I pulled myself together and found a 9 to 5 job working in an office as secretary to a private investor. My evenings and weekends were now free to roam the streets looking for people to invite to our Buddhist conversion meetings. I contacted Wilson Morelli who said he would love to have me teach at his studio in downtown Manhattan. I went to look at his class and was shocked. I could not remember what the steps were called! I was seeing ballet through the eyes of a stranger. I was in a mild panic. How could I hope to teach professionals when I couldn’t make sense of what they were doing? I was in trouble—after I quit ballet, I zealously burned all the ballet memorabilia: books on technique, beautiful photo books, and films I had taken of Erik Bruhn onstage—the man who was one of the greatest dancers of the 20th century and had mentored me. I purposely destroyed all the reminders of my ballet past so that I could prove I was completely happy being a “nobody” without any special identity. And now, in order to make a living, I was about to re-enter the ballet world. In desperation, I ran to the book store and bought all the ballet books available. My first class was attended by four students. Clearly, I had made a dreadful mistake—how would I survive making such little money? And teaching every exercise in 3/4 since I was too insecure to try anything else. As we now know, I did survive—and thrive—and am now in my 44th year of teaching. Because I had burned my ballet bridges, I was free to create my own ballet technique, based on teaching the way I wish I had always been taught – with sensible exercises that warmed you up slowly and thoroughly, built strength and artistry, and even more, with explanations on HOW and WHY we ballet dancers do what we do. Through the years, I’ve graduated to teaching adult beginners in classes at The Ailey Extension in New York, written a Technique book, and sold over 54,000 instructional videos. Another book and more videos are on the way. 2017, here we come! Everyone knows that there is no place like home for the holidays. The season brings hopes to nice and naughty children everywhere. For their parents, the chance to bring joy or put a smile on a child’s face is priceless – even if there is a little sticker shock. It is a time when the difference between luxury and necessity is blurred. Many work and sacrifice all year just to make the occasion more special for loved ones. Their generosity inspires kindness that is almost self-sustaining. That kind of impact can be felt over the course of a lifetime. The most amazing gift I ever received began a journey of self-discovery that continues to this day. A one-way ticket from Hawaii to Utah changed my life forever and I owe it all to the devotion of my mother. I was only eight years-old when my parents divorced. It was 1945, and the war was over. My father left the islands. 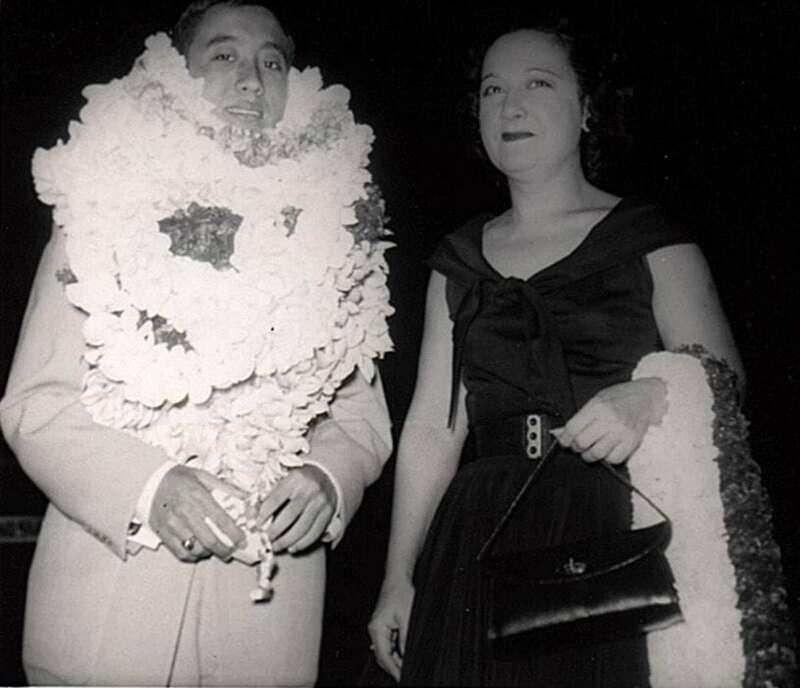 He also left his debt-ridden tailor shop at Hickam Air Force Base to my mother as our family’s only means of support. With the war over, however, most of the servicemen left the base, as well – to return to civilian life on the mainland. With the departure of the troops, the business was a struggle. Mom had to rent the tailor shop, pay two seamstresses and raise three boys. Searching for houses we could afford to rent, we moved six times in the span of five years. Each night my mother would come home with bundles of uniforms that needed alterations. After making dinner, she’d start ripping apart the seams of the uniforms so that the next day her workers would sew them together. Her ceaseless efforts and love for us three boys taught us to always do our best. Even at her busiest, she found time to encourage us to pursue our dreams – no matter where they would lead. By 1954, I was 17 years old, and I still had my dream of wanting to be a professional ballet dancer. I had no idea whether I had the talent, but I knew I had to leave Hawaii to find out. It was not easy to leave behind everyone and everything I knew. The Head of the Ballet Department at The University of Utah in Salt Lake City was Willam F. Christensen, famous for founding the San Francisco Ballet. I was accepted with a partial scholarship as well as a $160-scholarship from the Exchange Club. All great in theory, but there was one problem. We had no money at all. In fact, we hadn’t been able to pay the $14 registration for my senior year in high school. Miraculously, to me, Mom somehow found the money to pay for my plane ticket to Salt Lake City and living expenses to start off. It was the gift of a lifetime, but not in the way I thought in that moment. That one-way ticket has never stopped giving, and has allowed me to give more of myself than I ever dreamed possible. As a performer, I have been proud to share the artistry of ballet with generations of appreciative audiences. Since then, as a teacher, I have been blessed to impart the knowledge I have gained through a lifetime of collaboration with some of the greatest performers and teachers of our time. Going to Utah opened the door to my career in ballet that has never ended. Today, as a teacher to my adult babies at The Ailey Extension in New York and via my instructional videos – I connect with dance enthusiasts around the world every single day. I am forever grateful to my mother – who was born on Christmas day—and to my two older brothers – for believing in my dream even before I believed in myself. Every Christmas since, I think about mom and the greatest gift I ever received. Appreciation for this holiday classic spans generations and borders. In fact, for the next few weeks, versions will fill stages across the country – and the world. Joyfully, the performances will feature dancers of all ages, backgrounds and experience levels. How many promising dance careers were launched in the warmth of a theater in December, as young sons and daughters were inspired by the artistry and athleticism on display? Children are not alone in being captivated by the choreography in “The Nutcracker.” The music is familiar and irresistible —certainly a few parents would admit to trying to pull off a few steps when they thought nobody was looking. If you accidentally kicked over some furniture or tweaked a hamstring – don’t be discouraged. Every journey begins with a single step. However, it’s usually best not to start with the hardest one. “It was Christmas in ’55 and all through the house, Finis was fuming, not even a mouse.” – I vividly recall sitting alone in the dark in the theater at The University of Utah, watching a dress rehearsal for the “Nutcracker” and feeling as lonely as could be. It was Christmas, and we just didn’t have the money to fly me to my Mom in Hawaii. Meanwhile, I wasn’t even ready to be a mouse in our production. And I felt just that small. Still, I was determined to work harder to grow my ballet technique. Only three years later, I danced the “Snow Prince” plus the Spanish and Russian dances in our production. What great preparation for later in life, when I would be a father, teacher and student – all at once. My adult beginners, too, understand the complexities of balancing many roles with energy and passion. The versatility and perspective that adult beginners bring to dance can speed progress and understanding. The biggest obstacle to achievement for the adult learner is sometimes vanity. I know this too, from experience. 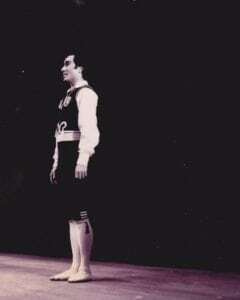 In 1960 I performed the Russian ribbon dance in “The Nutcracker” with Michael Smuin of the San Francisco Ballet. Trying to keep up with Michael, the best jumper and turner in the company— doing double air turns across the stage while holding beribboned batons with both hands high above my head—had me bouncing all over the vast opera house stage. Repetition and practice – my usual solution – failed to correct the issue and left my confidence shaken. My mental block was cured only when I realized that I was focused on trying to look text-book perfect (forcing my turnout and pulling up so much I looked like I was dancing on egg shells), instead of using my body as it was built and the correct body mechanics I had learned from Bill Christensen at the U of Utah. I was working outside of my own body! It took several years to overcome the mental block of falling all over the stage, but by 1965 I had regained my technique. 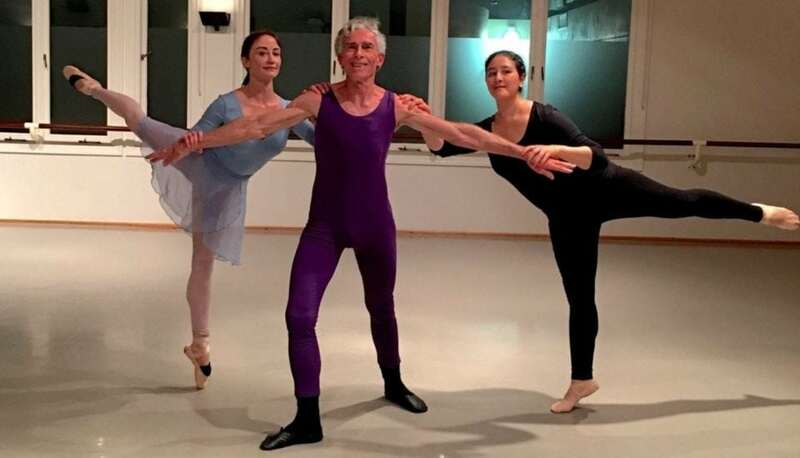 While dancing with the Harkness Ballet of New York in Cannes, I successfully performed sixty-four double air turns over the course of a single weekend. Four performances, without a hitch – occasion enough for the director to give me a bottle of champagne to celebrate as he thought I had set a new record for double air turns. My spirits should have been soaring. 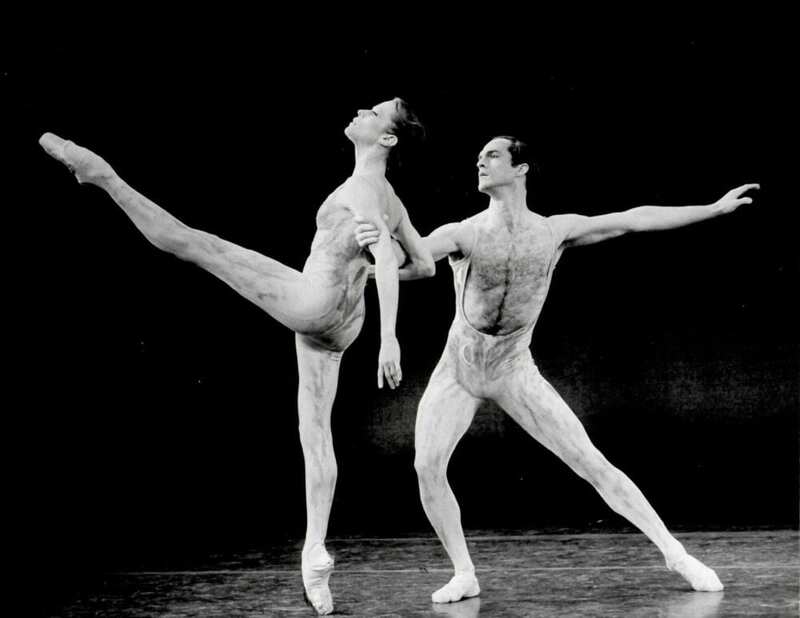 It was 1965 and The Harkness Ballet of New York was making its official debut in Cannes, France. I was a soloist in a company of 40 dancers, fulfilling my humble dreams as a small child in WWII Hawaii. Even so, I was not a happy camper. Of the 18 works in our repertory, only three were classical – my passion and forte. Worse still, I never got to dance them onstage. Much of ballet is centered on strength and grace. I found it hard to exhibit either limited to supporting roles as “exotic” characters. In fact, it was hard for me to take ballet seriously at a time when much of my time on stage was spent on the floor wearing knee pads rather than soaring through the air. It was particularly difficult to exhibit grace as the better parts went to other dancers. While I had great respect for their abilities, I felt with proper rehearsing I could do as well as they. Luckily for me, our guest star was the great Danish dancer Erik Bruhn. 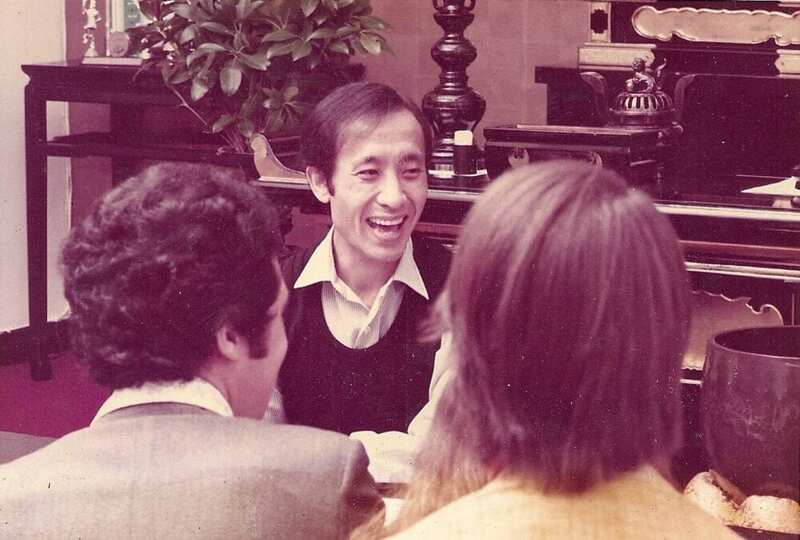 He was the recognized “King of Ballet”— a living legend with phenomenal technique and extraordinary grace and beauty. He helped me to understand that what separated the elite performers from the merely remarkable was not ability, but approach. Great stars always work overtime. Erik took me under his wing and became a mentor – let me sit in his dressing room while he made up his god-like face (and hair); let me do the pre-show warm-up with him; and coached me during rehearsals. In all things, he showed me how to do my best. Erik also taught me the importance of repetition – applying the same process to achieve the same result – day after day. Essentially, how you practice is how you play. After working with Erik, I was no longer concerned with what roles I had, but concentrated on perfecting my technique in preparation for better parts. Which did come with changes in our repertory the following year. Since then, my own experiences as a teacher have taught me that the world is a better place when every individual is inspired to reach his or her fullest potential. Working with adult novice beginners is especially gratifying, as our sessions aren’t only about improving technique but also enhance the quality of life. Whether you are a banker, doctor, lawyer, stay-at-home parent or billionaire CEO – the principles apply: discoveries in ballet lead to discoveries in life. Deeply immersing yourself in the movement process can lead to new life-changing thoughts in daily life. With dedicated repetition of the fundamentals, both student and teacher steadily move forward with knowledge, grace, vitality and strength. For detailed instructions, see my video, Basic Ballet Movement Skills, Lesson 2. The beauty of the arabesque depends on the correct placement of the head. The head must be centered on a high chest with energy going up the back of the neck. Stand in front of the mirror in first arabesque on the right foot. Your left arm is in second position, your right arm is extended forward defining the first arabesque position. Do not tilt your head to the right towards your right shoulder and arm. This is why you fall forward when you attempt a piqué arabesque (stepping directly on the half-toe). When you pose in arabesque on your right foot, use your left arm for balance. Reach out and towards the back with your left arm as you extend your R arm forward. Keep your shoulders level with the floor as you press down on the air with both arms. Standing on the right foot, think of listening to the music with your left ear. The rule of balance: Ears Back!